My internship at MediaTek has been an amazing experience, and I am extremely thankful to be a part of such an excellent company and industry leader working on the cutting edge of so many exciting fields. For the past several weeks I have had the opportunity to learn and contribute a tremendous amount, and I feel that what I have gained is priceless. As part of the Communication System Design (CSD) department, I worked on a team in the Advanced Communication Technology (ACT) division. I am very grateful for the chance to work with a group of such talented and accomplished individuals. Over the course of the internship, I have been able to acquire a vast amount of firsthand experience in software and data analysis. 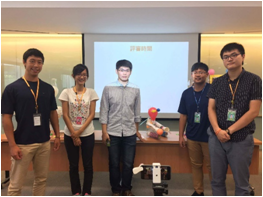 I became familiar with various algorithms of our project, incorporating supervised machine learning, and also learned and applied various data collection and data cleaning procedures. Along the way, my mentor and fellow teammates kindly provided excellent teaching and guidance, and I was always able to get assistance when I needed it, of which I am very thankful for. On top of technical skills, I was also exposed to a wide breadth of knowledge in other areas. From company-hosted talks given by industry experts and university professors, to weekly study meetings with my team, I learned about subjects like neurotechnology, nano-electrode arrays, reinforcement learning and Markov processes. Furthermore, I was able to improve my presentation speaking and organizational skills through team meetings. Also important was the look into how a company is organized and run internally. I observed how an engineering project progresses from initial design into final product, and how troubleshooting is done and obstacles are overcome along the way. From a larger perspective, through attending a company workshop and business strategy meeting I was able to see part of how overall planning is developed. All these skills and knowledge together will no doubt be invaluable for me in the coming future. I am incredibly grateful for the experiences I have gained here, and for such a fantastic opportunity to grow personally and professionally. Thank you so much to all of the CSD/ACT/SYS1 team, and thank you MediaTek!